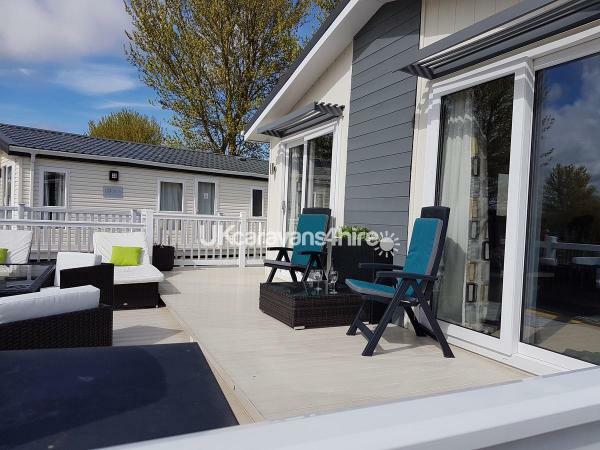 Our luxury lodge is situated on the beautiful Castlelake area of Haggerston Castle and has extensive decking with built in lighting, seating area with additional luxury sun loungers and comes complete with large gas barbecue. Inside it has a large modern lounge and dining area and features 50" HD TV with freesat, surround sound system and DVD. 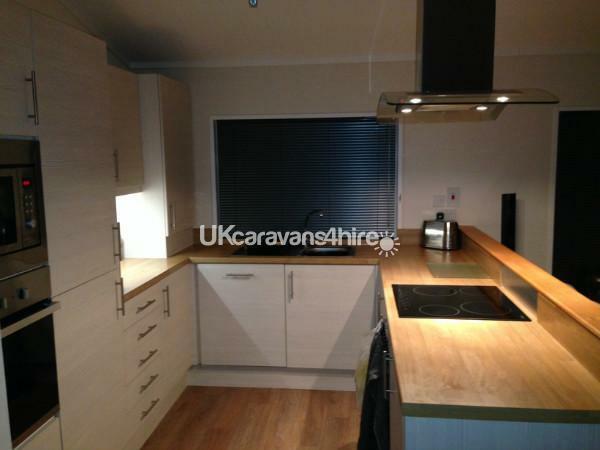 The kitchen is complete with cooker, microwave, large fridge freezer, dish washer and washing machine. 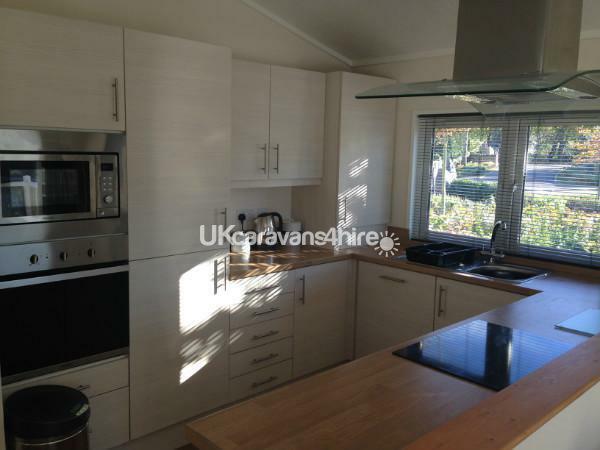 The lodge is fully equipped with all cooking utensils, toaster, kettle etc. We also provide an iron and ironing board. The main bedroom has a double size bed and walk in wardrobe leading to en suite shower room and hairdryer. There are also two further bedrooms which are twins. All bedrooms have flat screen wall mounted TV's, DVD. There is also a separate bathroom with full size bath. Bedding is provided however we do ask you to bring your own towels. A high chair is available for babies. Have just returned from a weekend at this lodge and we are already trying to pick dates to return! The lodge is stunning! So spacious inside and outside and the location is perfect. There is a massive gated decking area with a large gas BBQ which we made good use of, plenty of chairs and two sun loungers. The lodge is well equipped and clean. The only thing I would say is it would have been good to have had a shower attachment in the main bathroom as if you all want a shower you have to take it in turns to use the shower in the en-suite. Communication from the owner was great and we highly recommend this lodge! What more can I say about this lodge and owner!!!! Have been returning at least 3 times a year since 2013 .there is no better on the park.lodge fantastic in every way .richard fantastic in every way .if you book this lodge you will not be disappointed.we are just back and have already booked for me t year. This was clearly the best lodge we have stayed in on this site. 4 generations staying and plenty of room for us all. Lovely spacious lodge with excellent facilities. 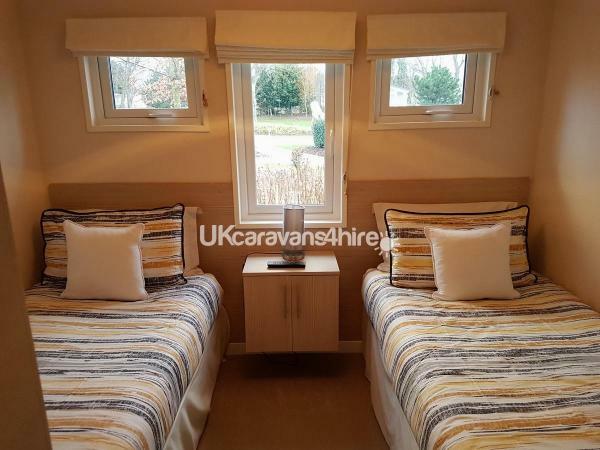 Beautifully furnished, nice comfy beds and lovely large shower cubicle in the en suite bathroom. 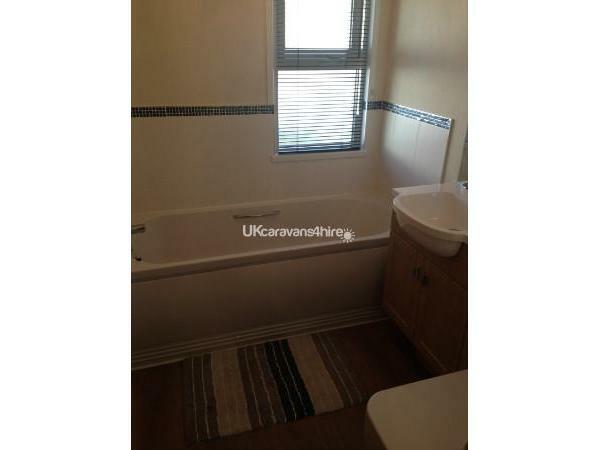 Plus a family bathroom with bath which is a bonus when you’ve got children with you. Perfect location looking out over the lake where my Dad (whose 93), our daughter and our two little granddaughters enjoyed watching the swans and ducks with their young. Space outside was excellent too, a double veranda with table, chairs, sun loungers and a gas barbecue which we made full use of. Contact with Richard was very easy and straightforward. Very helpful and prompt replies to any queries. A fabulous holiday had by all. Would highly recommend. You won’t be disappointed. We returned for our 2nd time!!! Again lodge was of a very high standard as was on our first visit. Lovely setting. Great outside seating area. Very spacious. Just booked again for 2019 for 17 days. This is our second holiday at your fantastic lodge and again found it to be spotlessly clean and just a fantastic place to stay. I would highly recommend for anyone wishing a holiday at Haggerston Castle you will not be disappointed as it is the best lodge with the best setting within the park. We enjoyed looking out each morning to the lake sitting on your decking having breakfast. We will certainly be back next year as our grandchildren just loved it. SUPERB. This is the 2nd time we have stayed in this lodge and it certainly won’t be the last. It is stunning and spotless inside and out. The owner was very helpful with any questions I had always very quick to respond. We can’t wait to go back. Only bad thing is it is so popular we can’t get booked for our dates in the summer. Need to be quicker booking next year. We have just returned from a most enjoyable and relaxing week at Haggerston Castle MAINLY DUE to the WOW FACTOR of the Lodge and it's location. A lovely, spacious, spotless and well equipped Lodge complimented with such a beautiful and peaceful lake view. We are hesitant to recommend the Lodge AS IT MAY MEAN WE WILL NOT BE ABLE TO BOOK IT IN THE FUTURE DUE TO IT'S POPULARITY!!!!!!!!! A special thanks must go to Richard for being so obliging and friendly and hopefully who will be able to accommodate us again sometime. Had a great stay, lodge lovely and clean equipped with everything you need for your stay. Richard very nice to deal with. Will definitely book lodge again for next year. Just back from our weekend break at this fantastic luxury lodge,we were there with 3 other family groups who were also staying on Castle Lake.We were celebrating our granddaughter's 18th, and grandson's 11th birthday's. When we stepped into our lodge my first word was Wow,beautifully furnished, spacious, Spectacular views onto the lake.TV in all bedrooms, our double bedroom was spacious, comfortable, lovely pillows. (I meant to look to see what make they were)Couldn't find fault with anything ,would definitly recommend this lodge to friends and family.Look forward to returning. We have recently returned from a 4 night stay at this beautiful lodge. 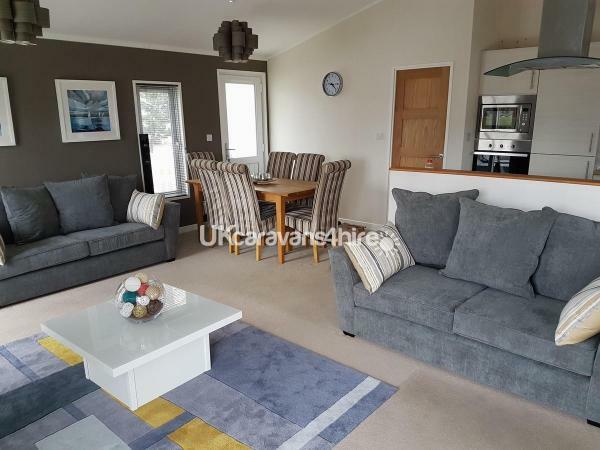 Everything about it was perfect - location is amazing (quiet and peaceful), lodge is huge, very tastefully decorated, wrap around decking just adds to the space. We were there with our daughter and grandchildren, they absolutely loved it and wanted to stay even longer. We will definitely be returning and would certainly recommend this wonderful place - I think it must be the best lodge/location on Castle Lake. Just returned from a wonderful stay at your lovely lodge. When we arrived we were very impressed with the size and layout. The lodge was very clean and had obviously been well looked after. We took out grandchildren aged 6 and 2 and they had a great time playing on the decking which was enclosed. We all enjoyed the view out to the lake and an added bonus, the sun was out. This lodge is a fantastic stay and we will certainly be returning. Just returned from our 3rd stay at this lodge. Amazing as always. Fantastic location, very clean, owners are wonderful to deal with. we had a great holiday and hope to return again soon. Lovely lodge and wonderful stay. Owner very responsive to emails and couldn't have been more helpful. Lodge is excellent - beautifully furnished, comfy beds, lovely comfortable sofas and spacious living room. Kitchen is well equipped with everything you would need. Really enjoyed the lovely outlook over the lake with gorgeous view of sunset every evening. Altogether a lovely lodge and we'll definitely be back. Just spent a week in this lodge and a must say it was the best ever kids loved it didn't get any complaints of them like I usually do and I would really recommend to any body else. Me, my wife, our son and three grandchildren spent a wonderful two weeks in this well sited, spacious and well appointed lodge. This was our second year staying in this lodge and we have already booked for next year, it is a perfect venue for our family holiday. The view of Castle Lake from the deck and through the patio doors from the Lounge are beautiful. The Castle Lake area of Haggerston is quiet and secluded but within easy walking distance of the main complex for entertainment and the golf course. We swam in the pool every morning, enjoyed the attraction on the park and in the surrounding area in the afternoon and the kids enjoyed the amusement arcade in the evening. Everyone had a great time. Can't wait for next year. This is a beautifully presented large lodge. 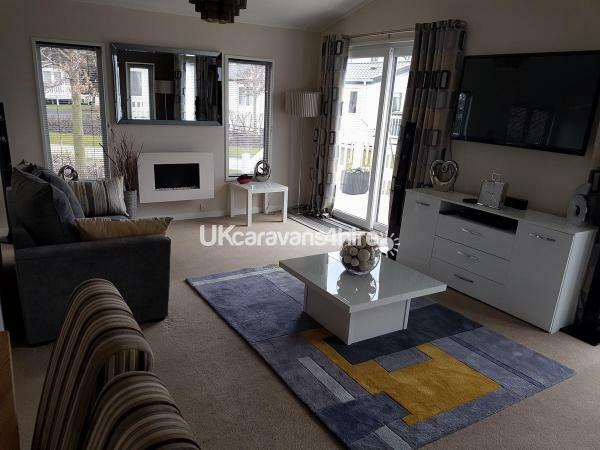 It has exceptional high quality fixtures and fittings throughout,and this along with it's scenic location provided a relaxing holiday from the word go. The booking process was quick and simple,and we wouldn't hesitate to recommend the lodge to anyone. Many thanks. Have just returned from our second stay at this lodge and have already booked up for next year. The location is perfect over looking the lake with neighbours only to one side which you don't see often . lovely and peaceful yet,just a short walk to the main complex. The lodge itself is beautiful, comfortable beds good quality finishing touches. It has a bathroom with a bath as well as a large powerful shower in the ensuite. 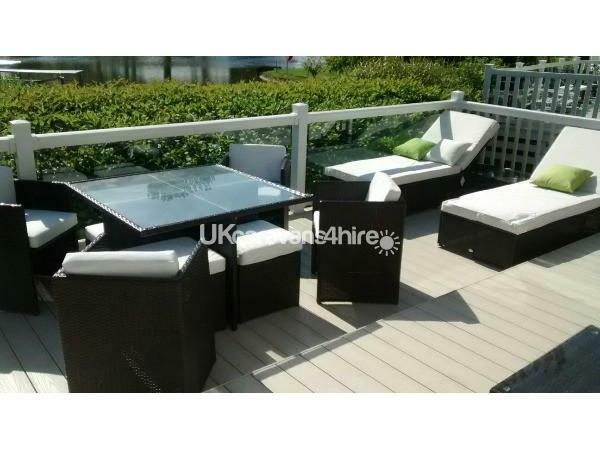 Large decking area with gates so perfect for little one, beautiful garden furniture including a large modular sofa. Owners are very easy to deal with communication is first class. Highly recommend and I look forward to returning next year. OUR SECOND STAY HERE THIS YEAR..........OUTSTANDING YET AGAIN!!!! CANT SPEAK HIGHLY ENOUGH OF THE QUALITY OF THIS LODGE,LOCATION AND FACILITYS. THE PERSONAL TOUCH FROM THE OWNERS IS EXCEPTIONAL. IF YOU ARE THINKING OF BOOKING THIS LODGE YOU WILL NOT BE DISAPPOINTED!!!!!! WE WILL BE BACK AGAIN NEXT YEAR. We've been regulars on this park since the kids were babies and I have to say this is the nicest accommodation we've ever stayed in. From booking to returning our security deposit, Richard has been a pleasure to deal with. The pictures on the ad just don't do justice to how spacious the lodge is. The veranda with it's lovely view over the lake is fabulous. Myself,my husband and children (14 and 12) have loved staying here and would recommend it to anyone. We'll be back!!! we would highly recommend this lodge, it was stunning, modern and very spacious!!. The decking area outside is beautiful with stunning views over the pond. My daughter enjoyed feeding the ducks and swans. It really made our short break fantastic staying in luxury with everything you could ask for. We will be booking up for next year!. The owners were easy to contact and got back to us very promptly. Theres not much more i can say without repeating the above reviews. We had a geat time. We have just got home from this fantastic lodge we did not want to leave. This lodge is beautiful inside and outside we could not have asked for anything nicer. It is situated on castle lake and in my opinion is the nicest part of haggerston the views from the patio are absolutely stunning. I would highly recommend this lodge I have not shut up about it since I got home and we can not wait to return. Also the owners have been excellent in communication very pleasant to deal with. I stayed here with my husband and two girls age 3 and 6. I have stayed in a few of the lodges in haggerston but this one was by far the best. 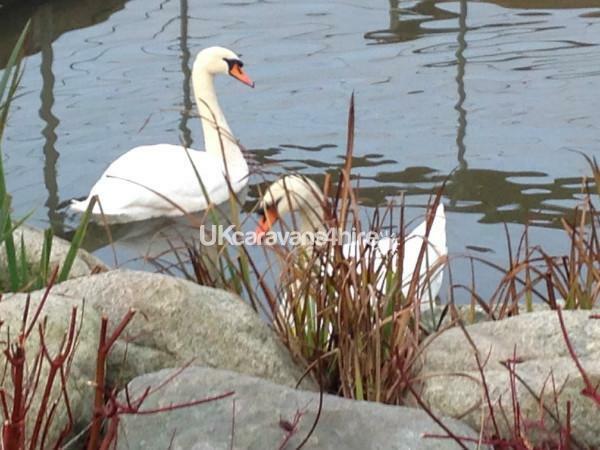 The property is located 5 mins walk from the facilities and the girls loved the lake where they could feed the ducks and fish with their dad. The owner is friendly and really helpful. I am booking to return again in October. Had a wonderful stay, spent lots of time on the deck with its great view of the lake. 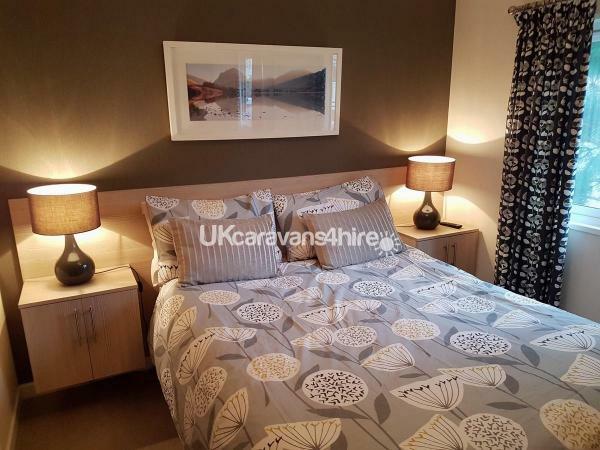 The caravan was one of the best in haggerston , everything was exceptional and very spacious. Would highly recommend. Me, my wife, our son aged 12 and three grandchildren aged 8,5 and 9 months spent a wonderful 10 days in this well sited, spacious and well appointed lodge. The views over Castle Lake from the Deck and the Lounge are beautiful. The Castle Lake area of Haggerston is quiet and secluded but within easy walking distance of the main complex for entertainment and the golf course. we swam in the pool every morning, enjoyed the attraction on the park and int the surrounding area in the afternoon and the kids enjoyed the amusement arcade in the evening. Everyone had a great time. Can't wait for next year. Fabulous lodge catered for 4 adults and 3 small children, the lodge was exceptionable spotless, everything you could want. Games and videos for the children, and facing the lake. Wouldn't use another, in 3 words FAB. Following a fantastic week at this lodge, we have finallly returned home on a high. This lodge is perfect inside and out. it is situated on a prime pitch in the beautiful castle lake, which personally we can say is probably the nicest area within haggerston castle. The lodge is finished to an exceptaional high stanadrd with all the latest mod cons. The owner has suppiled many extras - you name it hes suppiled it. I would recommend this lodge to anyone, sutiable for all age groups. The owner was curtious at all points of contact and repiled with speed to all questions. We have just returned from what has been our best holiday since becoming parents. We stayed in this lodge with our 19 month old son and we just loved every moment. Lodge is fantastic spotless inside and out and has probably one of the best locations at Haggerston Castle. This lodge is perfect in every way and I can not recommend this lodge highly enough. We will definitely be booking for next year if not before. Great communication from owners very helpful thank you Richard. SUPERB LODGE! SUPERB LOCATION! SUPERB OWNERS! Lodge is immaculate inside and out. Finished to a high standard. Bath was a real bonus for our 2 year old daughter. Fantastic large shower in en suite. Lodge has every item required its like home from home! MUST BE BEST LODGE AT CASTLE LAKE.!!!! And we have stayed in many. Location is beautiful,situated right at the pond at castle lake. Our daughter loved feeding baby ducks and swans. 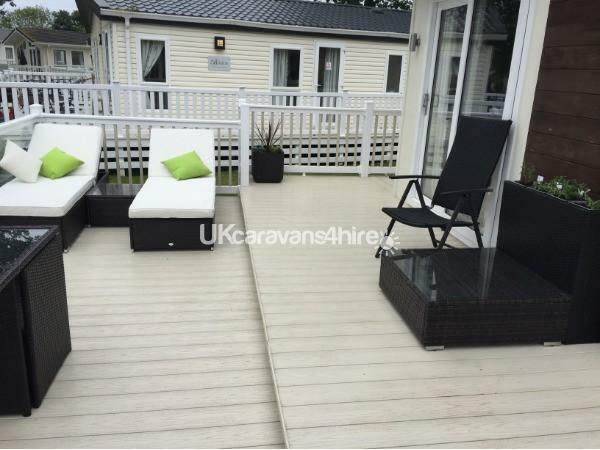 Decking has fantastic luxury seating for lounging on in the glorious sunshine and barbecue dinner finished it off. As for the owners OUTSTANDING!! Top communication throughout. First owners we have dealt with who cared about your stay and if you were HAPPY!!! Due to this before our holiday ended we managed to get booked up again in September for an 11 night stay and I'm sure that won't be the last time we stay in the stunning lodge. Stayed in this lodge and can happily recommend it to anyone going to Haggerston Castle. Lodge is very well equipped, spacious and spotlessly clean. Having been going to Haggerston Castle since i was a youngster myself can honestly say this is probably the best accommodation i have stayed in. The owner was a pleasure to deal with and happy to answer any of my questions and also dropped me a quick email to ensure we arrived ok and that we had settled into the lodge. Already planning a return to this lodge and hope that many others are fortunate enough to enjoy a break at this top class accommodation. 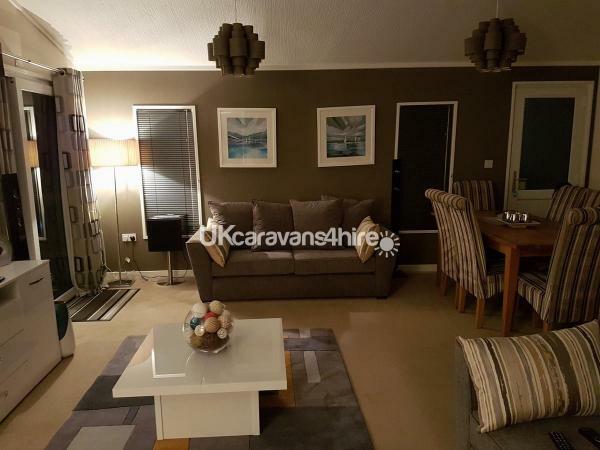 We have just returned from a wonderful holiday in your spacious, spotlessly clean lodge in a fantastic setting on the park right by the lakeside. We enjoyed sitting on the huge wrap around veranda that catches the sun all day and where we could feed the friendly wildlife. The lodge had plenty of everything we could have needed should we have decided to eat in. There was even games and videos for all ages provided. Definitely delivered everything it says in the advert plus many extras.